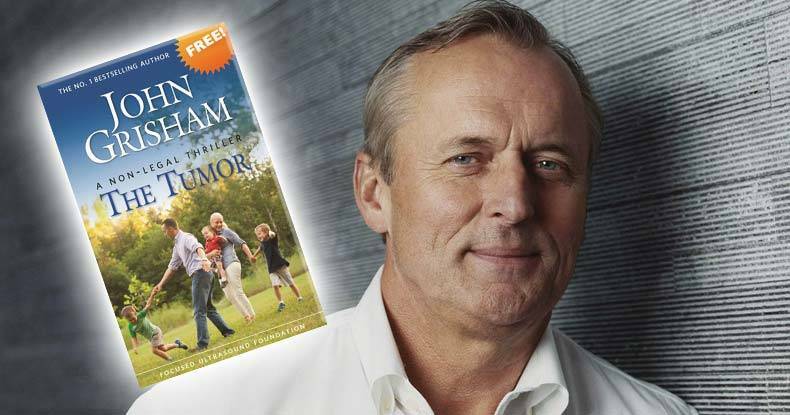 John Grisham’s latest novel veers far away from his typical courtroom settings to provide information about an alternative cure for cancer — and he thinks it’s so vital, the book is free for everyone. “The Tumor,” Grisham says, is the most important book of his career. Against the advice of his agent, editor, and publisher, Grisham has now offered the book free of charge. Its unlikely hero is a non-invasive medical device: focused ultrasound. Employed for the treatment of cancer and other diseases, focused ultrasound “uses energy beams to destroy diseased tissues,” reported the Washington Post. University of Virginia neurosurgeon and friend, Neal Kassell, convinced Grisham to join the Focused Ultrasound Foundation, which he’d formed in 2006, about eight years ago. When Kassell pleaded with Grisham to help raise money for the foundation’s ongoing research, the author balked. But after studying focused ultrasound and finding serious potential for the treatment method to aid millions of people, Grisham decided there was a better way to help. Thus, “The Tumor” was born. “I couldn’t think of a better way, in one fell swoop, to create awareness for this technology,” Kassell remarked. Grisham’s publishing empire warned against the sharp departure from his typical works, worried his audience would be highly critical. But he didn’t listen. This information, he felt, could better serve the public than another entertaining novel. Though his publishing team has been right to an extent — some fans have reacted as if Grisham set out to personally offend them. Others, however, conveyed gratefulness that the author’s fame could be employed to shine the spotlight on an alternative treatment with the potential to do so much good. While this is by no means an endorsement for focused ultrasound, it is nonetheless refreshing when alternative treatments make headlines, so people understand there are other methods of treating disease than what are typically recommended.